When it comes to blogging, we have many options to choose from, such as WordPress, Blogspot (Blogger), Tumblr and more. My recommendation is that always start with a blogger for a month, and once you understand and understand blogging, you should create your new self hosted wordpress platform blog. You can use Blogger as it is free but do not stick to it for a long time. I can say this because I started my blogging life from Blogger and later shifted to WordPress.org. It was difficult to know or learn anything at first but it is now quite easy to help with the help of WordPress's learning videos. In this article, I will share a quick comparison of WordPress and Blogspot with you, and I will tell you which platform you should use under which conditions. Blogspot: Why and why not? When you do not blog for money, or you need a platform that does not have any technical knowledge, BlogSpot is really great. At the same time, if you blogging for money, fame or your branding, then BlogSpot is not the ideal choice. The reason for this is that there is limited control on the visibility of your search engine, and after some time you have only some limited features to add. I have read this many times that Blogger is Google's platform, its SEO has more advantages, but it's a pure rumor. It does not matter exactly which platform you are doing, whether it is WordPress, Blogger, this and any platform, SEO depends on how you have configured your site for the search engine. We have limited control in the Blogger Platform, and despite the fact that it has added SEO benefits, there is a lot of SEO optimization in BlogSpot. 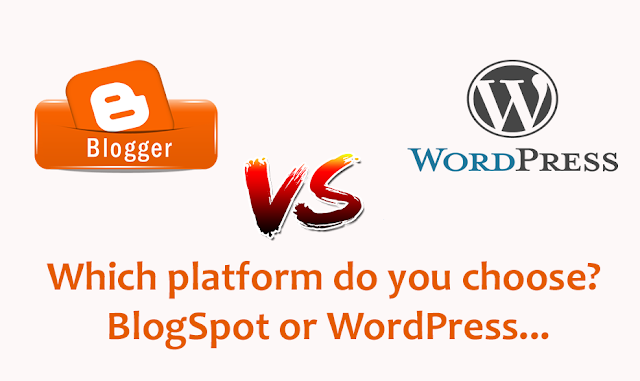 Blogger platform is great with wordpress platform, if you are creating a blog for your passion, and you are satisfied with the limited features of the Blogger platform. WordPress gives you complete control over your blog, and you can technically do whatever you want. You get complete control over SEO, you host your own files, you can add SEO plug ons, which help make your blog SEO friendly. More over, you can always add fresh SEO techniques such as star rating, authorship without sweating. WordPress gives you the freedom to do whatever you want but at the same time you have to manage your blog. You have to install WordPress on your server and keep up the blog. This work can be technical, but due to the support of WordPress community, you can learn everything without any hesitation. If you are building a blog, thinking that you have to make it popular, earn money from it, then you should prefer self hosted WordPress blog. If you are a occasional writer, or a hobby blogger, then BlogSpot is the best pick for you. Blogger platform is great, if you want a simple blog, and WordPress is amazing if you want to do professional blogging, want to make a business blog and earn money from your blog. Which platform do you prefer? And why? Any questions? Advice? Request? anything else ? Please comment.